Hey friends! Did you read my Resolutions post? You should! It’s a bit long, but (hopefully) inspirational as you map out your year of healthy eating, moving, and thinking. And let’s not forget healthy shopping! I haven’t done a grocery post in a while because my shopping has been all over the map since Thanksgiving/Christmas/Anniversary/New Years time. 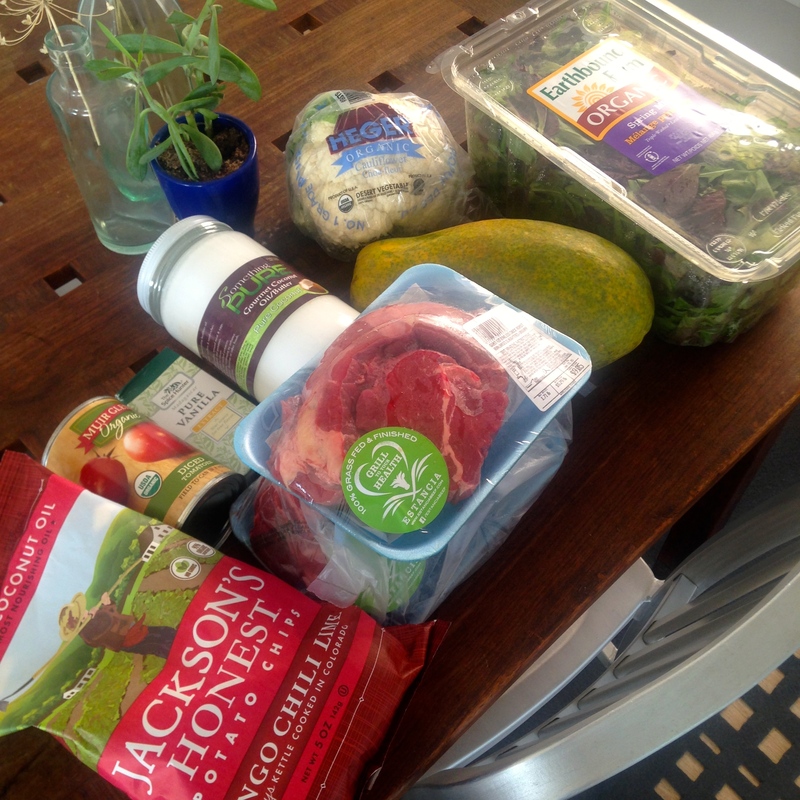 Today I did a legit, home-fridge-only shop and here are some of the items I picked up! Organic Spring Mix. I bought this strictly on principle. The price was a steal at $3.99 for a POUND of greens! Heck yes! Grassfed Chuck Roast. I decided to bust out another cookbook recipe. This time, I’m trying Juli Bauer’s Ropa Vieja from her //ws-na.amazon-adsystem.com/widgets/q?ServiceVersion=20070822&OneJS=1&Operation=GetAdHtml&MarketPlace=US&source=ss&ref=ss_til&ad_type=product_link&tracking_id=heavandheal-20&marketplace=amazon&region=US&placement=0985956240&asins=0985956240&linkId=O26ODZN34SN3COAC&show_border=true&link_opens_in_new_window=true” target=”_blank”>OMG That’s Paleo? cookbook. It’s also on her webby so click on the link! Caribbean Papaya. Also know as the sweet nectar of the gods. I had one last week and it was soooooo amazing. I obviously had to buy another one. Jackson’s Honest Mango Chili Lime Potato Chips. I’m really digging this company for it’s dedication to quality ingredients. How many chip makers out there use non-industrial seed oils? How about… ONE. This one. Jackson’s Honest Chips are a great contribution to the packaged food world. One small issue… I actually don’t particularly like the coconut oil flavor on the chips This is really tragic since I like to avoid the sunflower/safflower/canola crap. Give them a try and see if you like it! Organic Cauliflower. I NEVER buy cauliflower. Not sure why, but this paleo staple is remarkably absent from my basket most months. But since I’m following a recipe tonight, I’m also following Juli’s side dish recommendation. Cuban-Style “Rice”. WF: I once paid 8 dollars for a cauliflower at WF. Never again. Spice Hunter Vanilla Extract. I ran out and that’s a problem because I use it all the time for things like cashew milk, coffee fudge, paleo granola, coconut coffee creamer, etc. Something Pure Coconut Oil. I used the last of my coconut oil last night. And at this price, I definitely sprang for the giant jar. Haven’t ever seen this brand before but looking forward to testing it out. I just paid $10 for 2 cauliflower heads at Whole Foods. Talk about crazy! !